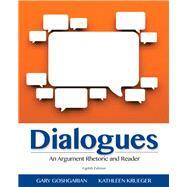 Dialogues represents argument not as a battle to be won, but as a process of dialogue and deliberation–the exchange of opinions and ideas–among people with different values and perspectives. Part One contains succinct instruction on analyzing and developing arguments, including critical reading, source documentation, and analyzing visual arguments. Part Two, updated with many new readings addressing current issues, offers a diverse collection of provocative essays from both the popular and scholarly medium. The lucid, lively, and engaging writing addresses students as writers and thinkers, without overwhelming them with unnecessary jargon or theory. *Hanna Rosen, The End of Men? *Steve Gunderson, For Profit Colleges—A Sneaky Scam or Saving Grace? Charles Murray, What’s Wrong with Vocational School? *Megan McArle, Is College a Lousy Investment? *Nicholas K. Peart, Why Is the N.Y.P.D. After Me? *Derk Thompson, Are Student Loans Destroying the Economy? Kevin O;Donnell, Why Won't Anyone Give Me a Credit Card? Nicholas Carr, Is Google Making Us Stupid?